Switzerland's largest city is also one of the world's financial capitals, and the so-called "gnomes of Z�rich" are a good deal wealthier than your garden-va pixie or leprechaun. So it shouldn't be surprising that the Swiss version of Fifth Avenue is home not only to many of Switzerland's finest stores, but also to some of its largest banks. 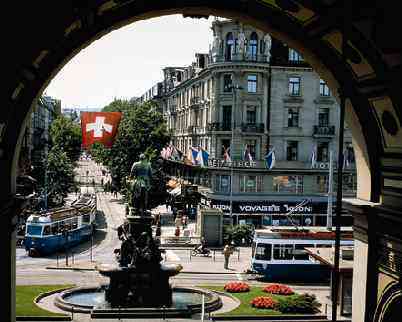 The Bahnhofstrasse begins at Zurich's Hauptbahnhof, or main railway station. Instead of trying to cross the Banhofplatz--which a veritable minefield of trams, especially at rush hour--take the station escalator downstairs to Shopville, an underground shopping mall, then return to ground level on the Banhnhofstrasse side of the square. As you walk down the Bahnhofstrasse, you're bound to be impressed by the street's human scale. The buildings are mostly four and five stories high, and many have 19th Century fa�ades. Trees line the sidewalks, electric trams glide quietly along the car-free traffic lanes, and--during warm weather--many of the storefronts are open to the street, creating the nearest thing to a Mediterranean atmosphere that you're likely to find in German-speaking Switzerland. The Vatican of Bally shoe stores, with footwear and clothing for big spenders of all ages. Switzerland's largest retailer of watches, clocks, and jewelry, with a good assortment of products in most price ranges. One of Zurich's two great department stores, with just about everything a serious shopper or casual souvenir hunter might need. The largest and oldest department store in Z�rich, and still an innovative retailer after 150 years. An outstanding bookstore, with more than 250,000 German-language titles available on the shelves or from an online catalog. Superb chocolates, pastries, and a tearoom. Just say "Ja" to the delectable cheese pastries known as Ch�s-Ch�echli. When you've had your fill of strolling, shopping, and eating chocolate, head past the banks and insurance companies toward Lake Z�rich. There, at the end of the Bahnhofstrasse, you can rent a paddleboat (during the boating season) or tour the Z�richsee aboard a lake steamer.